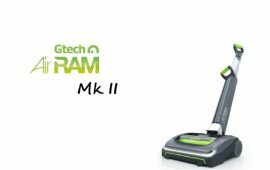 GTech AirRam Mk2 vs GTech AirRam Mk2 K9 | Which Air Ram is Best? Wondering what’s better, the AirRam Mk2 or the AirRam Mk2 K9? 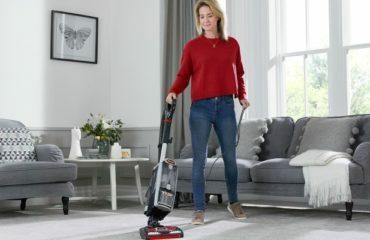 Below I reveal how the GTech Air Ram vacuum cleaners compare and highlight the best new features. Note: I have updated this review for 2017 and for the Mark 2 versions of both vacuum cleaners. You can only purchase the mark 2 versions now. Where does the K9 fit in..? With an impressive range of home and garden tools, GTech continue to develop and upgrade their cordless, electric product range. 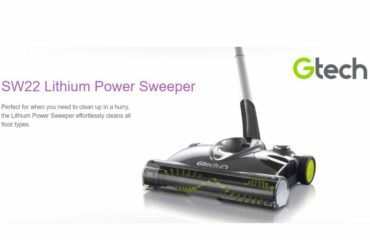 This time, they have released a new and improved version of their very popular and impressive GTech AirRam upright vacuum cleaner. 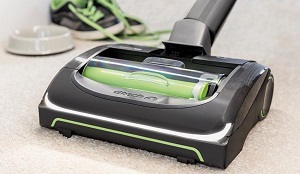 The new model is called the GTech AirRam Mk2 K9 Cordless Vacuum Cleaner. Let’s take a look at the difference between the GTech Mk2 and Mk2 K9. As the name suggests, it’s been specifically designed to help homeowners cope with canine hair (k9 = dog) and stubborn dirt that domestic pets can leave around the home. Here is a comparison between the original Air Ram and the new Mk2 K9 version. Note: Both the Air Ram and Air Ram K9 are mark 2 (mk2) versions. The originals were replaced by these upgraded options. Which is better, the AirRam or AirRam K9? 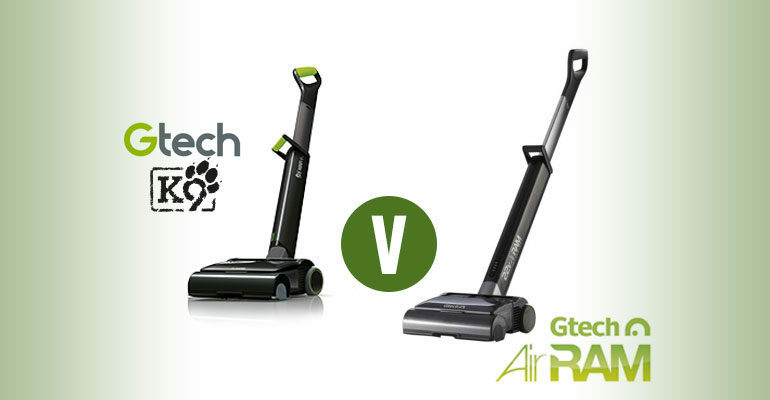 As you can see, the new GTech Hoover K9 is very similar to the original vacuum. There are some small but significant improvements, though, such as the use of zinc alloy metal for component parts which are designed to be more robust and handle a much tougher and rougher ride around the home. These improvements have added a small amount of weight, but only 300g, so nothing you’d notice easily. They have also included a scented fragrance filter so as you hoover you’ll leave your home smelling fresh rather than dusty. The dirt is still compacted into small, disposable bales just like the original and it operates in the exact same way. Is the new K9 Worth the Extra Cost…? It’s actually only £50 more expensive. With that you get peace of mind that you have the latest machine and all the lessons they learned from the first AirRam have been fixed. It’s sure to last for years, especially as it comes with a 2 year warranty as standard. If you’re not convinced about the Air Ram, you have a few other options. You could consider the Multi K9 which is a handheld cordless machine. It’s small, versatile and ideal for around the home. It’s also a complementary machine to the AirRam – the AirRam being an upright hoover. However…The latest release from GTeck is the new Power Floor. This machine is effectively a Multi K9 with upright capabilities. You can use it for both. It’s not quite as powerful as the Air Ram K9 though. GTech always deliver a great quality product, so you won’t be disappointed I am sure of that. Check out my review of the GTech AirRam and GTech AirRam K9 for more details. 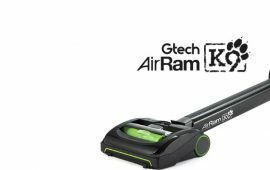 The best price for the GTech Air Ram K9 will be found by buying direct from GTech. They provide a 1st class service, 30 day money back guarantee, 2 year warranty and FREE delivery.